Last Thursday, Feb. 20, actors Amy Poehler and Adam Scott, as well as executive producer and writer Michael Schur, participated in an NBC-hosted conference call in which they answered questions about their popular comedy, Parks and Recreation; the Technique was lucky enough to participate in this call. The show, which debuted in 2009 and is currently on its fifth season, has received strong praise, including seven Emmy nominations and a spot as the number-one television series on Time’s 2012 year-end list. Michael Schur created the show along with Greg Daniels, with whom he also created the hit series The Office. “We really liked the mockumentary setup…” Schur said. Employing a mockumentary-camera style similar to The Office, Parks and Recreation is set in the fictional city of Pawnee, Indiana, which is home to a controversial and violent history, several bizarre and scandalous politicians, and an unreasonably high number of obese citizens. Poehler plays the quirky but loveable Leslie Knope, a city bureaucrat who works for the parks department. The show follows her life as she tries to accomplish such local government-related tasks as converting a pit into a park, organizing a harvest festival and running for city council. Scott portrays Ben Wyatt, a state auditor who settles in Pawnee and eventually falls for Knope. “I think we bonded with the city, even though it doesn’t even exist…I think Leslie’s just this weird person in this weird town, and it’s perfect,” Poehler said. Poehler’s character Leslie deals with several hilarious situations parodying the real-world bureaucratic system. One of the most acclaimed subplots in the show is Leslie’s relationship with Scott’s character, Ben. Leslie, who has been paired with several suitors in past seasons, including a shy policeman played by Louis C.K., a smooth-talking lawyer played by Justin Theroux and an extremely creepy MRI technician played by Will Arnett, finally tied the knot with Ben in last Thursday’s episode. Schur and Scott commented on the emotional nature of the episode. “I think we’ve had a few emotional moments on the show…This episode really gets you close to the characters,” Schur said. 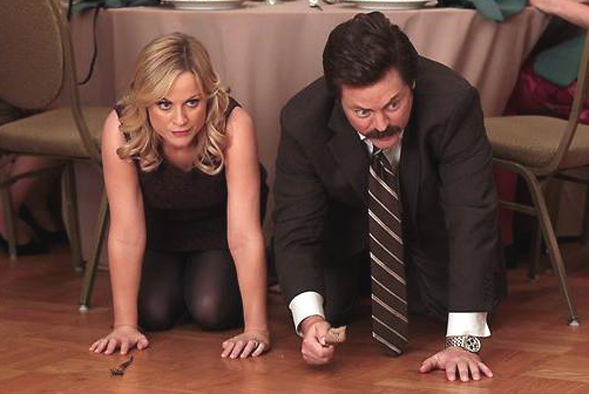 The episode follows Leslie and Ben as they hastily go through with their marriage, and is rounded off with several heartfelt moments interspersed with the regular Parks and Recreation hilarity. Comedy writing is tough to get into, especially at Tech. Talking specifically to the Technique, Schur gave advice on how to pursue a career path in comedy despite the stigmas that exist at an engineering school. “If you love comedy, you should try to write comedy. If that means trading in the companionship of the inveterate nerds who populate engineering programs for the inveterate (and much pastier) nerds who populate TV writers’ rooms, so be it. Do what makes you happy. Or at least try. Because, why not? The Second Law of Thermodynamics will still apply in five years if you decide to go back,” Schur said. He also commented on the art of comedy writing and on writing material that can be applied to a general audience.